Q1. Who owns the data/information that you enter? A. All of your personal and financial information remains your property. Trade Invoice is merely holding the data on your behalf. Q2. How is my information secured? Q3. Will my information / data ever be provided to another party? A. Trade Invoice will keep all of your information and data confidential. The data/ information will not be made available or distributed to any other party. Q4. What happens if I do not make a payment? A. You may use the system and obtain all the benefits provided your monthly subscription is paid for. In the event that payment is not made you subscription will revert to a free account. Q5. Can I have all or some of my records deleted? A. Yes. You can contact us to arrange this. Q6. 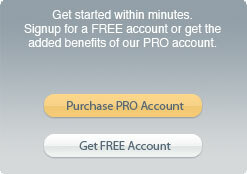 Can I upgrade my free account to a paid PRO account without losing my records? A. Yes. You can purchase an upgrade at any time by clicking "Go Pro" while logged in. Q7. Can I downgrade my paid PRO account to a free account? Q8. Do I need to buy any software to utilize Trade Invoice? A. As Trade Invoice is a web based application you do not need to purchase, download or install any software. Q9. Do I have to pay for any upgrades? A. No. All upgrades are provided free of charge. Q10. Does Trade Invoice collect money from my customers? A. No. Trade Invoice does not collect payment of any of your invoices or statements. In fact, there is never any contact between Trade Invoice and your customers. Q11. Is there a limit to the number of customers I can manage in my account? A. No. You can have an unlimited number of customers. Q12. Can I put my own business logo on quotes, invoices and statements? Q13. How do my customers receive their quotes, invoices and statements? A. You can send your invoices as a PDF, or HTML attachment to an email. Alternatively, you may utilize Trade Invoices postal delivery service or print and post/hand deliver the documents yourself. Q14. How do i pay for my subscription? A. You can pay by credit card or direct debit authority. A. We consider a document to be either a Quote, Invoice or Statement that has been printed or emailed. On a Free account you can enter as many customers, invoices, quotes, expenses or products as you want but you can simply not print or email more than 3 Invoices, Quotes or Statements in any one month. For example, you could enter and save 5 invoices this month, print or email 3 of them this month and wait until next month to print or email the remaining 2. However, that would only leave you with one more send in that month. Having said this, your very first month of a Free account allows unlimited printing and emailing, so why not give it a try and see if you like it. Q16. What will my invoices look like?